From sustainable farming to reforestation, VeeV is turning happy hour into a charitable act. Innovative spirits: Courtney, left, and Carter Reum. Courtney Reum ordered yet another vodka and soda and realized he was utterly bored with his drinking experience. The New York City investment banker had just helped complete the merger of two alcohol companies--Allied Domecq and Pernod Ricard--in 2005 and concluded during his due diligence research that the spirits space severely lacked innovation. "The Bacardis of the world launch a new flavor of Bacardi," he says, "but they don't tend to do things that are really outside the box--both as a product in the bottle and then as a company." During a surfing trip to Brazil in 2003, Reum learned about the burgeoning popularity of the Açai berry, which, the company says, has 57 percent more antioxidants than its fellow "super foods," pomegranates and blueberries. 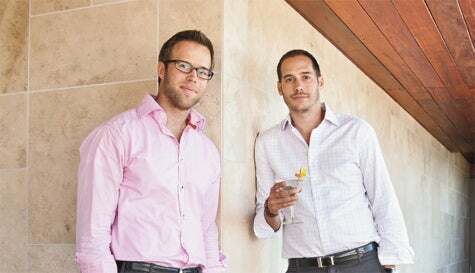 So Reum and his brother, Carter, came up with creating "a better way to drink" which ultimately became the tag line for VeeV, the Açai-flavored spirit they launched in 2007. Though quick to say the company makes no claims that VeeV is a health beverage, Reum adds, "We like to think of it as the red wine equivalent of hard alcohol." The Reums believe in sustainability and charity, so for their U.S. operations, they chose a distillery in eastern Idaho that uses wind energy, decreasing the electricity needed to distill the spirit. "Sustainability is kind of like working out. It doesn't matter [why you do it]. It all goes toward the greater good." For every bottle sold, VeeV donates $1 to retailer Sambazon's Sustainable Açai Project, in San Clemente, Calif., which promotes sustainable harvesting practices of the Açai berry and ensures that Brazilian farmers are paid a living wage for their region, doubling the standard of the equivalent of 4 American dollars per day to $8. In addition, VeeV employs approximately 100 people in Brazil to make bracelets out of the berry seeds, which are used as VeeV promotional items and sold locally. The bars and restaurants pouring VeeV wanted to be involved in the charitable component, too, Reum says. Thus was born the Treetini program. Bars and restaurants simply create their own versions of cocktails using VeeV, called Treetinis, and report to the company periodically how many were ordered. VeeV makes a donation to plant one tree in flood-ravaged Tamil Nadu, India, per Treetini served. When VeeV--derived from the French word vivre, which means "to live"--launched, the Reums sold it out of the back of their car. Soon, it caught on in a few markets in Los Angeles and New York. Within two years, it was in 20 markets and, during the past year, distribution has gone nationwide and annual sales now surpass $2 million. Reum, who calls himself a "New Age tree-hugger," says the brand's commitment to giving back at every level is a way for people to feel good about their cocktail of choice. "Sustainability is kind of like working out," he says. "It doesn't matter whether you do it for heath, vanity or some combination of other reasons. It all goes toward the greater good."